You may have forgotten what my bathroom looks like because it’s been so long since I chatted about it! Unfortunately, I’m not sure if this bathroom is the one that will make this dream a reality for me. 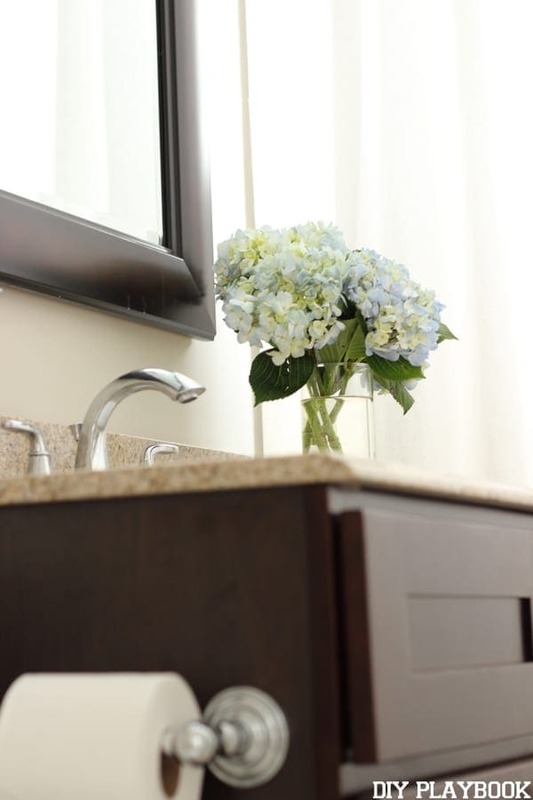 Our bathroom is nice, new-ish, clean, and not necessarily worth me putting big bucks into (as in…. I don’t think the value of our house would increase if we spent some big bucks to gut this already nice bathroom). So as much as I would love to change this bathroom to align with what I LOVE, I’m making the economical choice to make the most of what we have by incorporating decor that will make it feel a little more “me”. As you can probably tell by now, I love light and bright…. everything. Some of my friends pull off dark, rich decor and it looks AMAZING in their spaces. 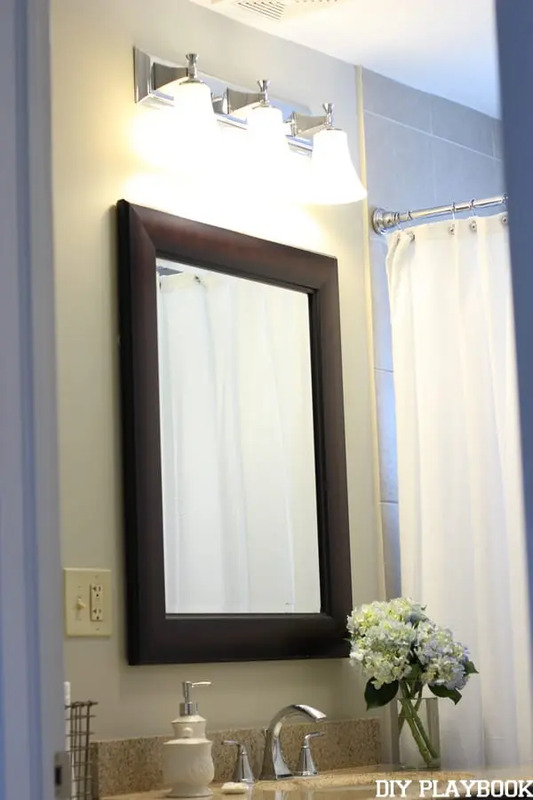 But for me, I love living with more light and bright decor, and I don’t feel like our bathroom reflects this style. The vanity is not going anywhere since that would mean major renovation, BUT I never really thought about switching out the mirror until Casey suggested it. Ughh…. GENIUS?! Why didn’t I think of that…. 3 years ago?! <—- Thank goodness I have her! 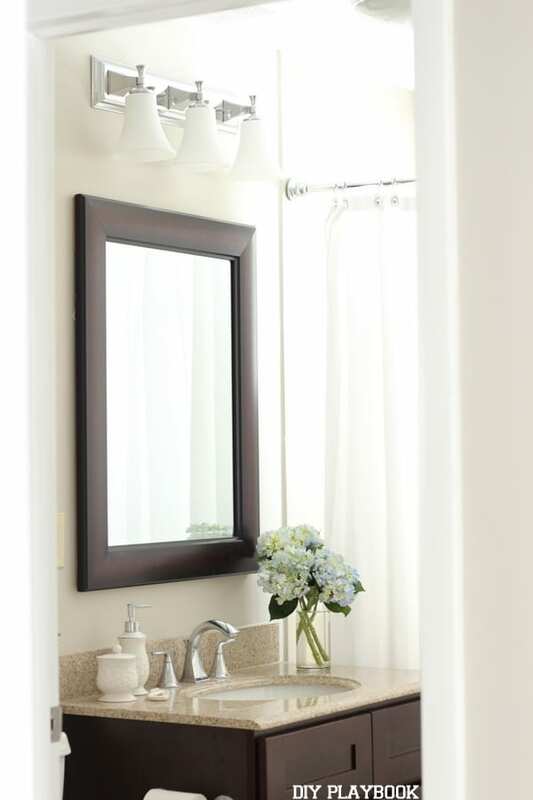 Just like the vanity, the mirror is also dark and not necessarily aligned with my light and bright style. It came with the house and honestly, I never really thought about swapping it out for something a little less “matchy-matchy”. When Casey and I chatted about options to replace this mirror with, she mentioned that maybe I should try a round mirror to make this space a little less heavy/dark/matchy-matchy. Once again, GENIUS! (Thanks Case!!). 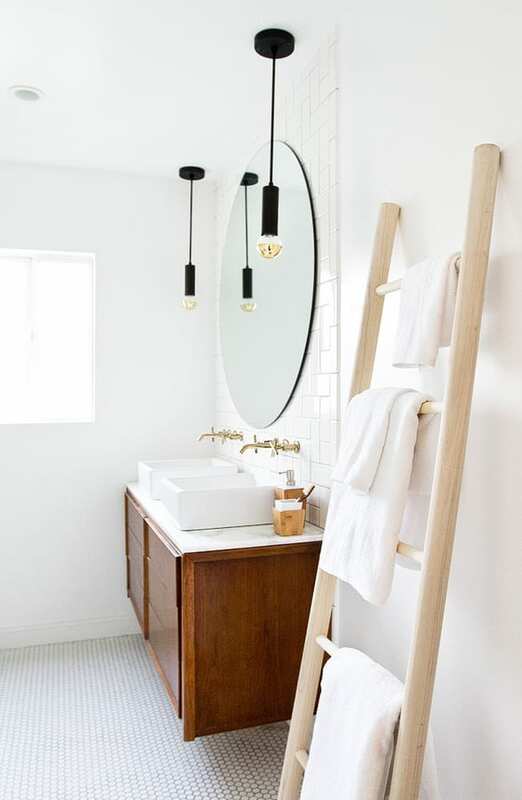 I always love the look of a round mirror in the bathroom when I see inspiration photos on Instagram or Pinterest, but once again, never really thought to incorporate it into this small space. I mean, how gorgeous are these inspiration spaces?! 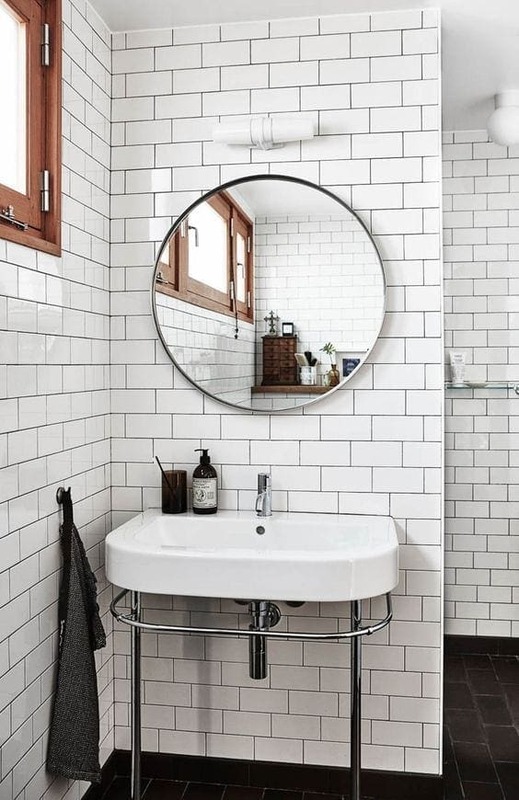 I’m bookmarking all of these gorgeous bathrooms for my future bathroom renovation dreams but for now, I’m just taking the design inspiration from the round mirrors and incorporating this design into my own space. 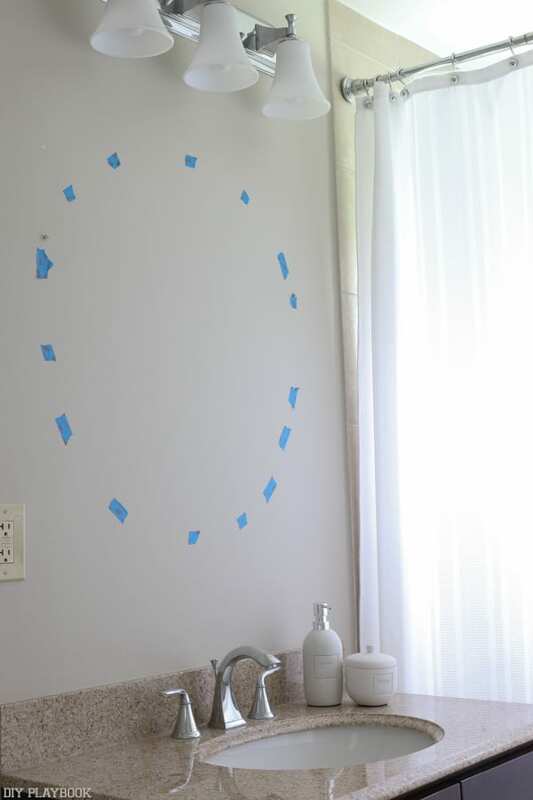 To make sure I would love the look, I removed the existing mirror and added painter’s tape to visualize what a round mirror would look like in this space. Before I even put the last piece of tape up…. I was already loving this idea! Here are some of the mirrors I have my eye on. 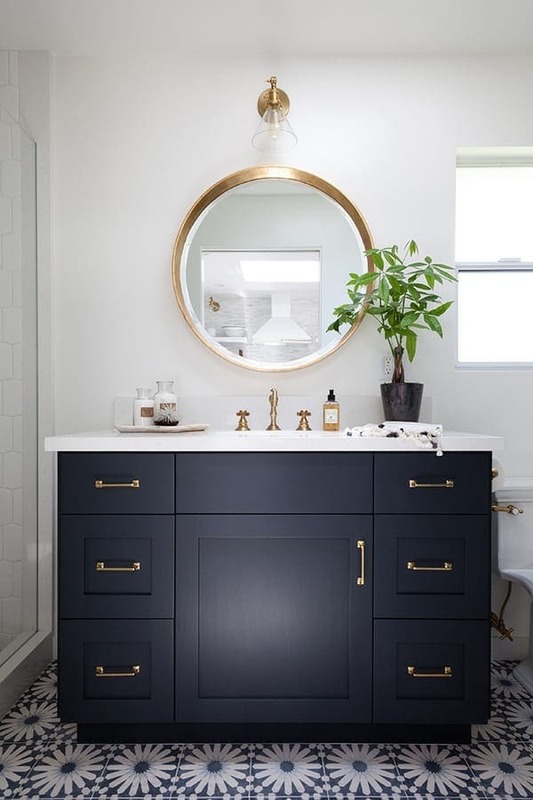 Since I have a chrome faucet and hardware in this small bathroom, I feel like I probably have to go with something silver even though the bronze/gold options are stunning (adding a gold/bronze round mirror to our future bathroom renovation wishlist). And based on my measurements I need a 30-33″ diameter mirror, which definitely narrows down the options. I’ll keep you updated on the process but I’d love to hear your thoughts. 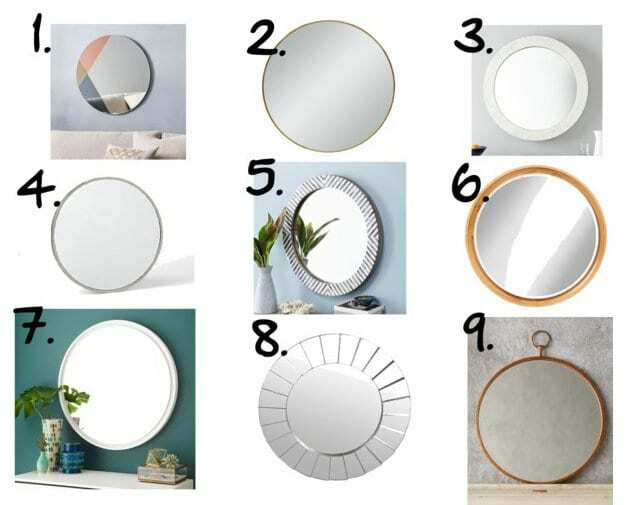 Which mirror is your favorite?! 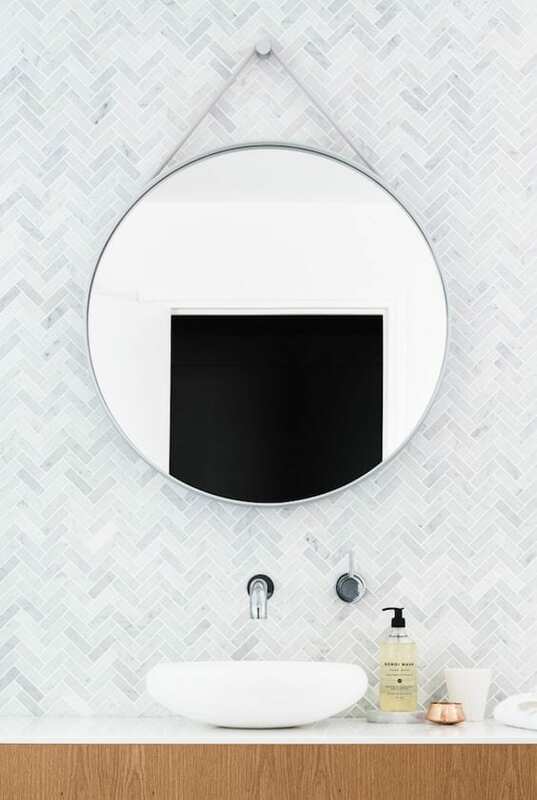 Do you have a round mirror in your bathroom? If so, anything I should consider before buying one?! P.S. 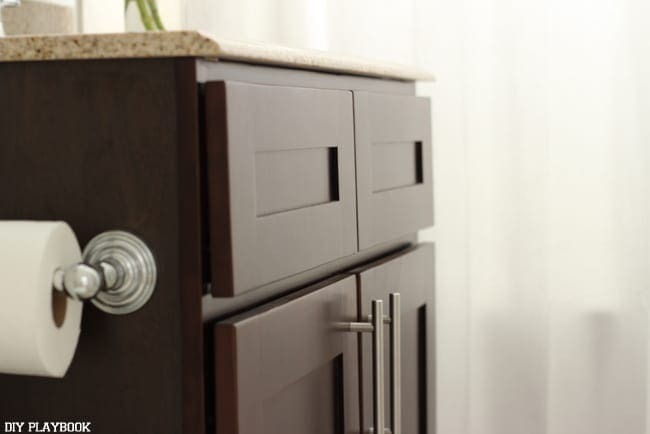 Did you hear that Casey’s home is a finalist in the #GGatHome tour contest on Glitter Guide?! We are excited & we’d love you forever if you took 10 seconds to give her home a vote right here.